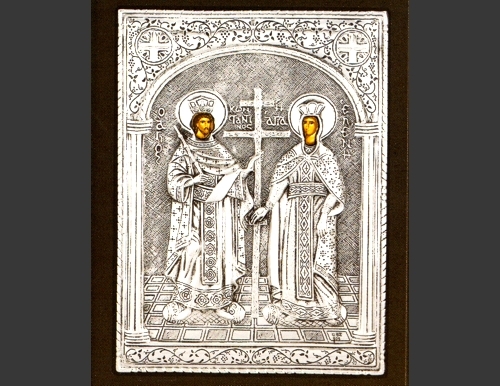 An exquisite silver Greek Orthodox icon of St. Constantine & St. Helen. St. Constatine is famed for his re-founding of Byzantium as "New Rome," which was always called "Constantine's City" Constantinople. With the Edict of Milan in 313, Constantine and his co-Emperor removed all onus from Christianity. 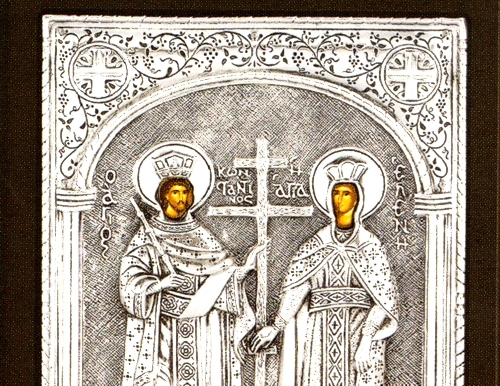 The Orthodox Church keeps his feast on May 21, along with his mother, Empress Saint Helen, as Holy Equals-to-the-Apostles.